The temperatures makes suiting up in protective gear not only safer, but more comfortable. I enjoy the process of donning my armored jacket and overpants, buckling up the boots and closing up my full face helmet. As I toss a leg over the bike and watch the instrument panel light up and fuel pump prime, it’s the closest thing I’ll get to being a fighter pilot. 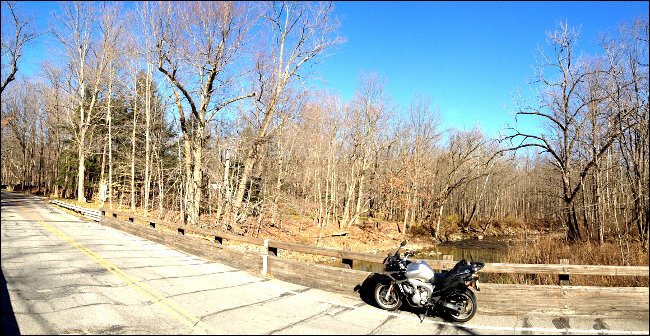 When you meet up with another motorcyclist at an intersection, gas station, or parking lot, there’s usually some quick conversation about how thankful you both are to get another ride in while the weather is nice, as well as the commiseration of dread for the coming winter downtime. The Fall weather seems to make the entire experience “crisper”. The stark, leafless trees contrasting against the asphalt of the winding road. The cool wind washing over you that brings your senses to full attention. The quiet that seems to dominate the woods sliced by your motor revving through gears. Finally, even when the day’s ride is done, there’s the feeling of having gone out and accomplished something, even if it was just to celebrate one last ride before the snows come. Passing by cars on the way to your home, there’s always the evil thought that you might be passing some rider who decided not to take advantage of the day, with the pleasant sensation that comes with knowing you did.